Packing hand luggage is something we all have to think of before we travel by air. We have therefore put together these air travel packing tips to make it easier for you to pack your carry-on bags and get through airport security faster. The first rule is to pack your carry-on bag with security in mind... airport security that is. Not only will it reduce the possibility of items being confiscated from your bag, it will also get you through airport security as quickly as possible. Carry on luggage restrictions vary from one country to another and the rules can change with short notice in line with the latest air travel security concerns. There are simple things you can do that make the security screening process run as smoothly as possible, wherever you are in the world. This article focuses on the TSA airport luggage regulations as they cover all international air travel to and from the US (including those in transit). Many international airports also align their carry on luggage restrictions to the TSA regulations. It is a good idea to check the airport luggage regulations for the airports you are going through prior to packing hand luggage. How To Pack For Airport Security? When packing hand luggage start by finding out what you can and cannot pack in your carry-on bag. Each country can restrict which items passengers can carry but prohibited items usually include flammable materials, chemicals, sharp objects, weapons, liquids, sprays, etc. Airport authorities can confiscate anything they consider dangerous, even items that are normally allowed in hand luggage. It is therefore safest to leave items behind if you are unsure if you can pack them in your carry-on bag, or at least check them in as luggage. It is advisable to be organized when packing hand luggage, i.e. don't just throw your things into your bag. Messy bags are more likely to be opened for further inspection. When packing hand luggage you have to pay special attention to all liquids. Packing liquids in suitcase and checking it in is the easiest way to travel with liquids, just make sure you wrap them properly to avoid any spilling. 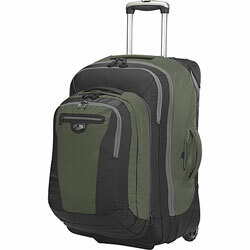 Many travelers however prefer to travel with carry-on bags only. If you are one of them, make sure you follow the rules about packing liquids when flying. 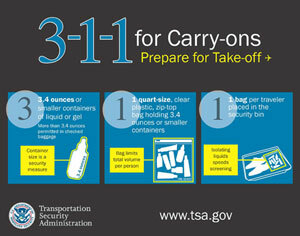 Consider using TSA compliant bottles, the so-called 3-1-1 carry-ons (see below). But what classifies as liquid when flying? Simply put, if you can pour it, pump it, squeeze it, spread it, smear it, spray it or spill it... then it is liquid when flying. This means gels and aerosols are liquids as well as drinks, shampoos, perfumes, etc. TSA has issued easy to follow 3-1-1 packing liquids rule. You should be fine in any international airport if you follow this rule when packing liquids when flying. There are exceptions to all rules. Some liquids are allowed in reasonable quantities but you must declare them for inspection at the airport security checkpoint. These exceptions include medications, baby formula and food, and breast milk. If you are travelling with a laptop or other large electronic equipments, then you must make sure it is easy to remove them from your carry-on bag to be X-rayed separately. Oversized electronics include laptops, DVD players, cassette video cameras, full-size video game consolers, etc. Smaller electronics, like iPods, can remain in the carry-on bag. You can now b buy heckpoint friendly laptop bags that allow your laptop to remain in the bag for airport screening. Religious garments, including head coverings, are permitted but if loose fitting or large enough to hide prohibited items then you may be directed to additional screening area for further inspection. "Just" follow the above air travel packing tips when packing hand luggage and you will fly through security. Check out B for Bag selection of Hand Luggage for any occasion or check out some of our favorites below.